A pair of Bucks County Democrats have teamed up to launch a PAC aimed at electing a new generation of Democrats in Pennsylvania. 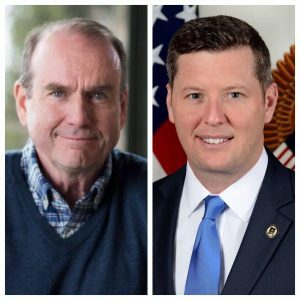 Former Undersecretary of the Army and Congressman Patrick Murphy and Scott Wallace, former candidate for Pennsylvania’s 1st Congressional District, established the Kennedy Democrats PAC yesterday. Murphy and Wallace selected to use the Kennedy name because they lauded the family’s work for being “synonymous with authentic public service – in the military, politics and through the Peace Corps, Special Olympics, and so much more.” Murphy was the recipient of the John F. Kennedy New Frontier Award in 2009. The PAC already has their sights set on a number of races this year and has pinpointed eight county commissioner races to assist the Democratic candidate as well. The five candidates they have endorsed already are Pam Iovino, state Senate candidate for the 37th District, Bob Harvie and Diane Marseglia for Bucks County Commissioner, and Jordan Yeagar and Daniel Baranoski for judicial races. The eight “critical” county commissioner races they are targeting are in Berks, Bucks, Centre, Chester, Dauphin, Delaware, Monroe, and Northampton Counties. Kennedy Democrats labeled specifically focusing on areas outside of Philadelphia and Pittsburgh on their “About Us” page. They haven’t yet had to file reports with the FEC, but boast about raising over 6 figures. Former Rep. Chris Carney, Philadelphia City Councilwoman Cindy Bass, Centre County Commissioner Mike Pipe, state Rep. Patty Kim, and PA Young Dems President Stephen Rudman are on the advisory board. This is ridiculous. Wallace is just propping up all the people he paid off (cough Marseglia cough) so he could LOSE A CONGRESSIONAL SEAT that was so so so winnable. When will he go away? A “new generation? Puh-lease. Scott Wallace is pushing 80 and Patrick Murphy has lost more races than anyone wants to count. The Kennedys have come and gone from the political scene, and are now largely irrellevant. Think Chris Kennedy in IL and Kathleen Kennedy in MD, both hyped up and turned out to be duds and this organization is well on its way to being. Also the name, seriously? WTF does that even mean, Kennedy Democrats? It meant that you were a new kind of democrat, focused on the future and our youth, compassionate and smart, intolerant of injustice, and it separated you from the other Democrats. We hope to embody all of those things moving forward and to support candidates who do the same. This would be a joke if it wasn’t for the comete ineptitude of Bucks GOP Chairwoman Pat Poprik. When she loses the courthouse this year, it will never return to GOP control again. Oh great. Wallace has found a place to perch and it’s taking credit for a transition in Bucks that he screwed last election. Pat- you are better than this.